Ellijay, GA is the home of the Georgia Apple Festival! Each year, thousands of people come to Ellijay in the North Georgia Mountains to explore the historic downtown and be a part of the popular Apple Festival. 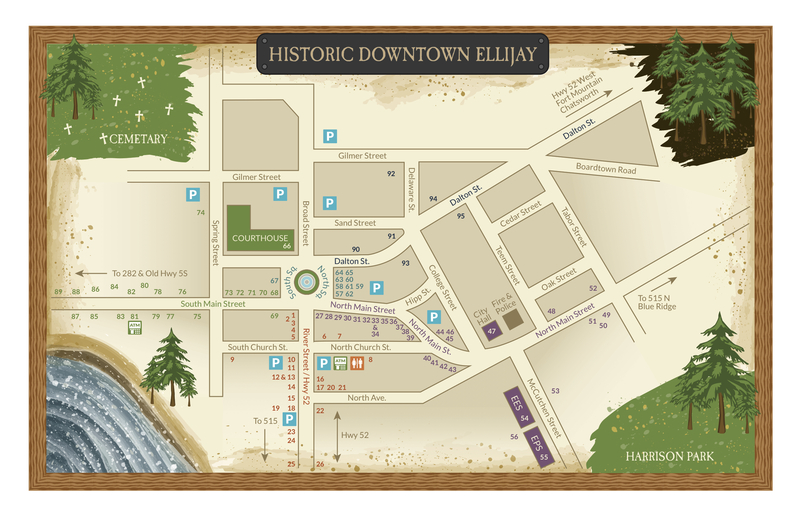 Whether you like picking apples, shopping in cute local boutiques, touring vineyards, riding the trolly, or going to Abby’s Ice Cream and Frozen Yogurt, Ellijay has everything you need for a family fun weekend…you will just need a Downtown Ellijay GA Apple Festival Map Guide! If you are here for the Ellijay Georgia Apple Festival, you will definitely need this Ellijay GA Apple Festival Map Guide to point you in the right direction for a fun and stress-free experience! Here are some great food places, restaurants, and desserts to enjoy while you are visiting Ellijay, GA for the Apple Festival. These are all included on the Ellijay GA Apple Festival Map Guide created by Karla Haege and the Gilmer County Chamber. 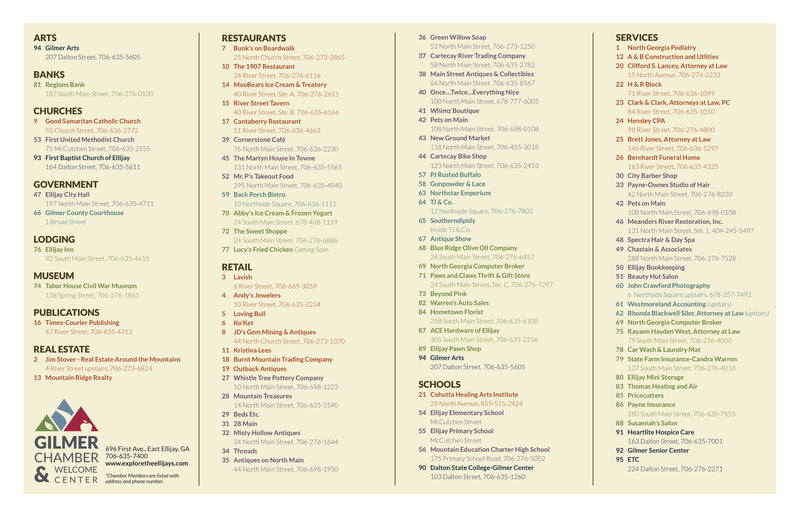 Here are some unique retail shops, boutiques, antique shops, and fun stores that are included in the Ellijay GA Apple Festival Map Guide. Need some money to spend at the Ellijay GA Apple Festival, here is a quick list of banks and ATM’s that are close to downtown Ellijay and are included on the Ellijay GA Apple Festival Map Guide. If you and your family are looking to spend the day picking apples and visiting the Georgia Apple Orchards, there are a lot to pick from! Some of these apple picking orchards for apple festival get super busy, but it may just be worth the wait! Here is a GA Apple Festival Apple Orchards Map. Ellijay, GA is one of the friendliest places in America! The people here are genuinely nice always are willing to offer a helping hand. Ellijay is a fun place for exploring the North Georgia Mountains, mountain biking and hiking, touring the historic Downtown Ellijay, shopping at local boutiques and antique shops, riding down the many pristine rivers, picking apples, and so much more! Use this Ellijay GA Apple Festival Map Guide to help you plan your special weekend!